Making things well and finding beauty in what most people might think is weird or disgusting is what Ben Smith does best. Each of his pieces of jewellery has a tale to tell and reveal deeper layers of meaning throughout its design. Growing up as a black-teed bogan from West Auckland, Ben Smith learned early on to trust his gut. He knew that he would have to carve out his own direction in life. And in that vein he has. Constantly. Ben has been around. From cruising the streets of West Auckland in a handful of dodgy, lowered vehicles, to residing in the student town of Dunedin, Ben has lived the classic storybook life of a struggling artist on the dole. He now resides smack bang in the middle of these two cities, in good old windy Wellington. In Te Horo, actually, on the Kapiti Coast with his partner, four chickens and a baby goat called Puke. About embracing change is how Ben describes his personal art style. His ornamental artwork reflects a strong, creative, restless drive and passion for the unusual. His direction in life is always changing, evolving and growing. Right now he is busy creating wearable, contemporary statement jewellery pieces for women and men. Who knows where, and what, he will be up to next? Artist’s description: This piece is about land sales/swindles in Aotearoa, NZ. It’s a commentary about the division of land and how differences between individual ownership and collective ownership didn’t marry together very well. Materials: A fitting from a deco bathroom scale, Perspex, acetate photocopies, sterling silver, chain based on old land surveying chains from the 19th century. It was in the student town of Dunedin, way down, deep in the South, that Ben first picked up some basic silver smith jewellery techniques. Inspired by friends producing interesting hippy-type jewellery, Ben managed to ‘weasel his way into one of his friends studios’. But he didn’t take his interest in ornamental art beyond that. Instead he painted, what he describes were at the time, self-obsessed oil paintings. Artwork inspired by Dunedin’s wild and dramatic landscapes. New Zealand’s bush, wildlife, wild places and even a stint working in conservation influenced his art work and creative direction in Dunedin and it has again in later years resurfaced, continuing to transition through into his ornamental jewellery artwork both in theme and as contextual inspiration for his ideas. Artist’s description: This design is a jam made of bone. I had the idea whilst working in the remote Ettrick valley in Fiordland and I love making abstract human forms. His clarity of direction and focus onto jewellery formed when Ben moved to Wellington and began studying art and creativity at The Learning Connexion. He discovered that he suddenly had the time, the space and the access to lots of creative tools, people, ideas and resources. Ben was able to explore all sorts of art making that he’d wanted to try for ages. This indulgent period gave him a pure and uninterrupted timeframe in which to just be an artist, to be completely self-directed and to follow his gut and to just do what he felt was right at the time. Jewellery and sculpture quickly become his focus. The TLC tutors pushed him in some pretty interesting directions, offering Ben loads of professional advice and tried to expand his thinking – to step outside of the conventional and to trust in his process and in his own ideas. What he learnt stuck and he now wants to pay it forward – to share and pass on that knowledge to others by looking to apply with Volunteer Services Abroad in Tonga for two years. Ben describes his personal art style as being all about embracing change. In that vein he also designs jewellery that is specifically for male wearers. Currently there isn’t a lot of jewellery out there for men. With this in mind he began designing very plain fronts with more intricate backs. Materials: Mother of pearl and sterling silver. Materials: Found rusted steel, glue, 24k gold leaf, mother of pearl, Perspex and plastic. He likes to use found objects, plastic, mother of pearl, acetate photocopies, stirling silver, Perspex and rivets. His jewellery is multi-functional and contains things like movable arms and glow in the dark plastic. It will often feature brightly coloured possum fur, fake grass, mother of pearl, bone and ebony. He also has a collection of possum teeth at his disposal! 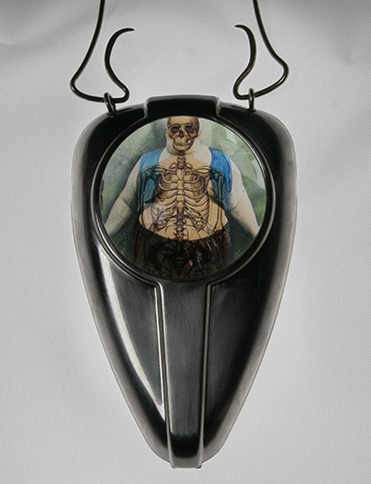 One of Ben’s earlier jewellery series explored the idea that parasites attach to a person in as much the same way as jewellery does. Another of his series ‘Through a Colonial Lens’ explored the colonial era, showing a historic bent that brought together colonial maps, ships and New Zealand landscapes into high-end, wearable statement pieces. Several of these colonial pieces had a decorative back that was known only to the wearer. This added a duality to each art piece and featured a parallel to the design of the front, or an extra dimension to the story narrative. ‘The Entrance into Poverty’ brooch. Artist’s description: I like the idea of microcosms worlds trapped behind glass. I’m a history and political buff and wanted to express my thoughts on NZ’s colonial history – the dirty bits of history that we don’t really like to talk about. The picture on the back of this brooch is of the entrance into Poverty Bay. He shortened the title to “The entrance into Poverty”, in order to talk about how Cooks arrival heralded the descent into general poverty for Maori. Materials: Sterling silver, glass lens from deco bathroom scale and Colonial era print showing the prostitution and sale of Maori wahine and scientific studies of Maori weapons and artefacts. Ben’s repurposed art jewellery range also showcases a more lighthearted, sometimes brightly colourful and quirky approach to his personality. Materials: Sterling silver, possum fur, possum teeth, Perspex, glow in the dark plastic, 24K gold and acetate. Right: ‘Glowing Kehua 1’ brooch. Materials: Glow in the dark plastic, Perspex, possum fur, box thorn, sterling silver, 24K gold leaf and mother of pearl. 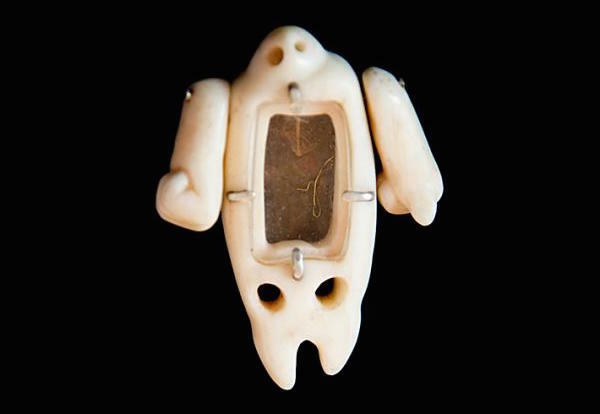 His Kehua Men (or Ghost Men) brooch series is unashamedly male. Penises feature as strong symbols. Made to be big, bold, and heavy, these colourful brooches are multi-functional, detailed and therefore require some very dedicated wearing. 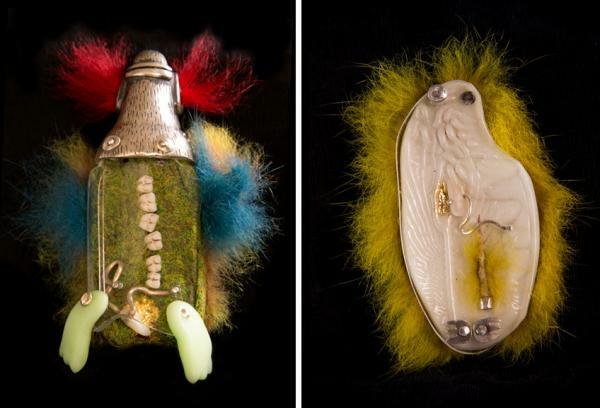 They are inspired by the use of fur in Papua New Guinea ritual gift exchange ceremonies, and are essentially jewellery jams – a combination of cool and interesting materials with traditional jewellery casting techniques. Contact Ben via email if you would like to buy any of his pieces or if you want to commission a design. To find out more about our NZQA approved programmes call us on 0800 278 769 or request a prospectus. Want to defy convention, make your own jewellery or improve your existing skills?